Description: This Divyadesam is a shrine to Govindaraja Perumaal located in the famed grand Nataraja temple complex at Chidambaram. The vast Nataraja temple complex is referred to as 'Kovil' in the Saivite tradition, as the Srirangam temple complex is in the Sree Vaishnavite tradition. Chidambaram represents centuries of history and tradition and is second to none in representing the vibrant culture of India. Pictured above, is one of the entrances to this grand temple complex. Deities: The moolavar here is Govindaraja Perumaal in a reclining posture facing east while Taayaar is Pundarika Valli in here own sanctum. There are two festival images here; the first of the Utsavars is Parthasarathy in a seated posture, and the second is Chitrakootattilullaan. Legends: Chidambaram has been held sacred for time immemorial for its association with the Cosmic dance of Shiva. Legend has it that upon the request of Patanjali (an incarnation of Adi Seshan) and Vyagrapadar (the sage with tiger claws), Shiva re-enacted the Dance of Bliss, to the accompaniment of music played by the celestials. All of the Devas and Gods are believed to have gathered here to witness this grand spectacle. 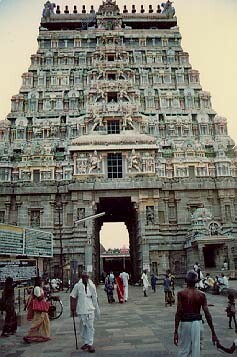 The Temple: Govindaraja Perumal's shrine faces east, while Nataraja's shrine faces south. Perumal's shrine has its own circumambulatory passage and a set of towers. This shrine was renovated during the period of Vijayanagar rule. Please follow this link for more information on the layout of the Chidambaram temple complex.